Sen. Leach steps down from his role as Judiciary Chair, while Gov. Wolf is set to deliver his budget address today. Here is the Playbook. Leach Steps Down As Judiciary Chair: In a statement, the Democratic state Senator stated he made the decision to “avoid even the appearance of a conflict of interest.” Leach was recently accused of a sexual misconduct from 1991 with a 17 year-old. He has denied these claims. 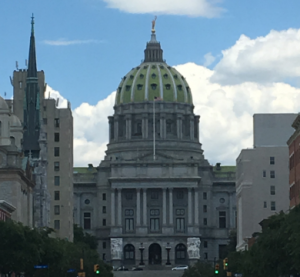 Rothman Named New HRCC Chair: Speaker Turzai says that Rothman is a problem-solving conservative and is confident he will help them maintain their majority in the House. James Announces Bid For PA Superior Court: The Allegheny County criminal trial and appellate lawyer is the second Democrat to enter the race. Pa Post: In budget address, how ambitious will Gov. Tom Wolf be? Morning Call: Who are Pennsylvania lawmakers bringing to the State of the Union address? Morning Call: How will the VA’s new rule on private health care work? Philadelphia Magazine: Johnny Doc’s People Told Us to Reach Out to His “Friends” for “Fairness.” So We Did. Post-Gazette: Gun for Bill Peduto on Twitter, and he’ll fire back — but should he? WESA: Who Gets A Break On Property Taxes And Why? Reading Eagle: Reading’s Kyley Scott handled nearly 12,000 nontraffic citations in 2017 — 3 times more than any other district judge in Pa.
John Baer: Why not build the wall (with other people’s money)? Abraham Gutman: Being an immigrant is hard. 21 Savage is a reminder that being a black immigrant is even harder. Diana Nelson Jones: Walkabout: Do we have the fortitude to end our violent ways?